Does the Spirit of God reside in you? God’s desire is not to reside in a Temple of bricks and mortar, but in the temple of our hearts. Beverly is bringing God’s presence to the patients that come to her clinic. She cares for them; she intercedes for them; as a Gospel singer and concert violinist, she sings and plays for them – she loves them just as Jesus would love them if he were physically present. He is present to them through Beverly. 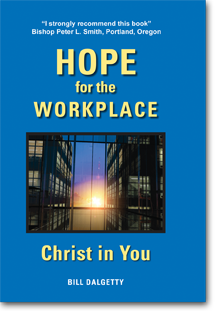 Read more in Hope for the Workplace – Christ in You, p. 37, www.zacchaeuspublications.com. When we open the gates of our heart to his presence, God shares his own Holy Spirit with us. The Spirit of God comes to dwell in us and empower us to do the same things that Jesus did and even greater things. God’s love becomes our love, his strength becomes our strength and his word becomes our word – all for the purpose of bringing about his Kingdom through us to the people and circumstances of our lives. Lift up the gates of my heart, O Lord that the love and mercy of your presence may be manifest to all whom you place in my path – my wife and family, friends, colleagues, bosses, subordinates, customers, suppliers and strangers. This entry was posted in Uncategorized on April 20, 2015 by stevedalgetty1. It takes a lot of effort to support a lie. Can you remember a time when a little “white lie” led to another lie and then another? The chief priests and elders of Jesus’ day did not know how to deal with an empty tomb and the possibility that Jesus, whom they crucified, was raised from the dead. Most everything that Jesus said and did was outside their paradigm for a Messiah. His resurrection was untenable to them. So, they devised a lie and paid those who were guarding his tomb a large sum of money to testify to the lie. Providing cover for a lie can get complicated, taking time, creating anxiety and exacting an emotional toll. How often have we seen a public figure pay a high price for living a lie, sometimes costing them their marriage, family, career and, like the chief priests, even hush money? In Hope for the Workplace – Christ in You, www.zacchaeuspublications.com), there is the story of Pat who had struggled to get a job after completing her master’s degree. She obtained temporary work at a small university to write a report about the effectiveness of a federal grant for a media center to improve teaching methods. When her report included survey data about the lack of use of the media center by the faculty, she was asked by the department chair to alter the data so that he and the university would not look bad. He implied that a permanent job would be in the offering if she acceded to his request, but probably not if she refused. Pat refused to go along with the lie. The job was not offered. But Pat’s conscience was clear, and her response helped her get a better job elsewhere several months later. This entry was posted in Uncategorized on April 13, 2015 by stevedalgetty1.